Many YA novels don't feature parents in a predominant roles in the story. Parents are either entirely absent or become like the teachers in the Peanuts comic strip who talk in gibberish. Corrine Demas's Returning to Shore is a refreshing realistic fiction book not about teen angst or high school drama, but rather a teen hoping to establish a connection with her estranged father during her summer vacation. Please note that this review is based on the advanced reader's copy I received from the publisher via Netgalley. Description: Her mother's third marriage is only hours old when all hope for Clare's fifteenth summer fades. Before she knows it, Clare is whisked away to some ancient cottage on a tiny marsh island on Cape Cod to spend the summer with her father--a man she hasn't seen since she was three.Clare's biological father barely talks, and when he does, he obsesses about endangered turtles. The first teenager Clare meets on the Cape confirms that her father is known as the town crazy person. But there's something undeniably magical about the marsh and the island--a connection to Clare's past that runs deeper than memory. Even her father's beloved turtles hold unexpected surprises. As Clare's father begins to reveal more about himself and his own struggle, Clare's summer becomes less of an exile and more of a return. 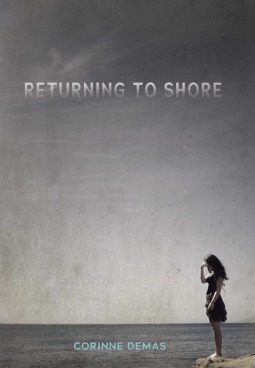 Review: Returning to Shore is a quiet, lovely story about a young girl reconnecting with her estranged father during her summer vacation. The book does not have much plot, but it is rather episodic which works well for this story. Clare is less than thrilled with her mother's plan to have her spend three weeks on a remote island with her biological father, Richard, when he mother jet sets on a honeymoon with husband number three. Clare hasn't seen her father in twelve years, and they only speak on Christmas. Unlike her mother, Richard isn't much of a conversationalist, but he also doesn't ignore Clare's presence. Richard's quiet demeanor is his way to give his daughter's space to adjust to living with him. What I appreciated the most in this story is the gradual closeness Clare and Richard achieve which I found to be realistic. Both are concerned they are not enough for each other and through Richard's work preserving the nests and habitat of the endangered Northern diamondback terrapin they find common ground and slowly develop a friendship and eventually toward an honest and loving relationship. Saving the endangered Northern diamondback terrapin becomes an allegory for Richard and Clare's relationship. What I also enjoyed is finding out small clues about Richard's past and the real reason he and Clare's mother divorced. One big flaw that I found in the book are some obnoxious secondary characters who are walking cliches who believe they are entitled and ignorant of things around them. I groaned ever time they appeared in the story and had to speed read those parts until I got back to Clare and Richard. Overall, I do recommend picking up Returning to Shore if you are interested in reading more YA books that focus on teen parent relationships. Words of Caution: There is some minor language and a scene of underage drinking as well as some mature themes. Recommended for strong Grade 7 readers and up. It is kind of funny that YA doesn't have much parent involvement. Especially when they are the most consistent (well generally) relationship most kids have. I like the sound of this one except for the secondary characters. Well, it doesn't seem like they got too much in the way of the story. Thanks for the rec! "Parents are either entirely absent or become like the teachers in the Peanuts comic strip who talk in gibberish"<-- Ha! Too true. I find that I can always appreciate books that have an emphasis on a familial relationship so this one sounds great.